When you find yourselves in a situation with no transport we provide a taxi-transfer service around Kranjska Gora and the Julian Alps, to airports, and for the Alpe Adria Trail. 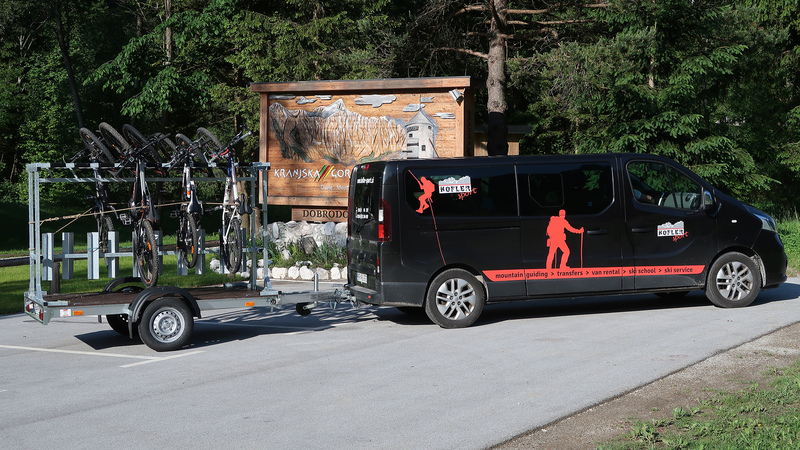 We also provide bike shuttles and transfers for groups of cyclists and skiers. Transfers are provided in two comfortable Renault Traffic Passenger minibuses, both of which have air-conditioning. One minibus can accommodate up to 7 passengers, and the other 8, therefore, transport is possible for a total of 15 people. Both minibuses have an extended luggage compartment, which enable the transport of large quantities of luggage. One minibus is also available for hire, which can be turned into a mini mobile home. We can also install a 900 l Montano luggage rack on it (for skiing). In co-operation with other agencies we can also provide transport for a larger number of people. We connect alpine valleys: Krma-Vrata; Ukanc-Vrata, Zadnjica-Vrata….